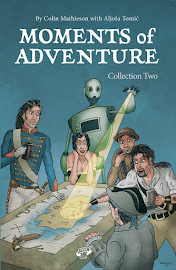 Moments of Adventure: Thought Bubble Moments! 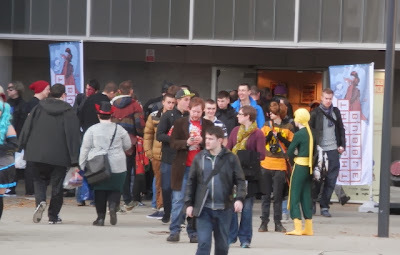 Thought Bubble 2013 is that-a-way! Gosh that was quick, the weekend's Thought Bubble festival in Leeds brought Accent UK's long year of comic shows to an end and was a suitably good way to wind down 2013. Given the problems the organisers had with fulfilling exhibitor table requests, the addition of a new hall in vacant shopping units gave everyone who wanted to, the opportunity to exhibit, for which the organisers deserve thanks in responding to the unprecedented demand. However the question was always going to be whether this demand would be matched in increased attendance and spend to warrant the extra investment? On this point, and purely on our numbers and observations, I would say the jury's still out. Its hard to say but would reckon that attendance was pretty similar to previous years which of course meant with even more exhibitors, people's spend was spread even further. 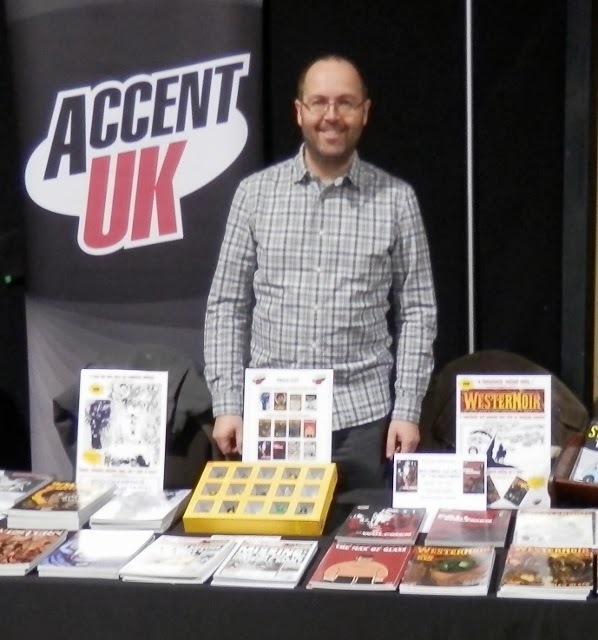 Its not surprising therefore that our own sales were down from 2012, but in fairness we had a host of new books last year which helped boost our sales to a record tally. 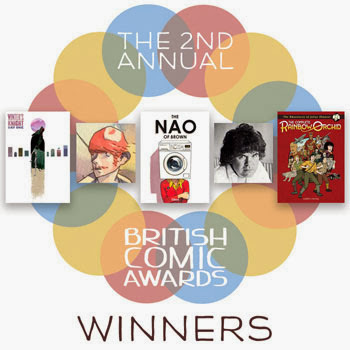 With only a couple of new things this time we expected a modest showing which is exactly what we had, although we still comfortably beat 2011's sales, so it's not all bad. 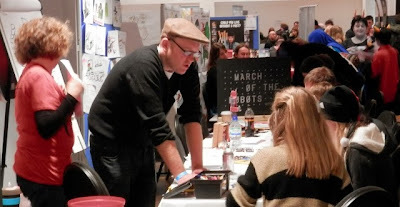 Most exhibitors I spoke to were similarly 'okay' with things with no-one saying they had done amazingly good or bad, just 'okay' and in fairness for a cold November weekend at the end of a busy convention year that's not too bad really, considering everything else the show had. Colin eagerly mans the AUK table - note Dave's lego boxset centrepiece! 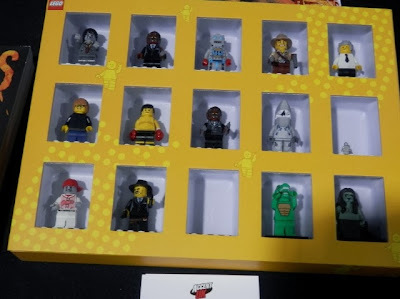 A close up of Dave's lego set of Accent UK comic characters - can you find them all? And that's the key thing, much like the recent Lakes event, its not all about the numbers, its as much about the community and social aspect as you catch up with familiar faces and discover new works, this combined with brisk early sales helped remind us that despite the table booking problems, Thought Bubble is still the place to go for the best mix of professionals, independent and small press creators and arguably the UK's best comic show in an increasingly crowded market. That said, I don't envy the organiser's job in planning for next year when they'll be keen not to repeat the online exhibitor lottery but presumably they won't have the option of those vacant shop units? Anyway back to this year and Dave and I had a blast in catching up with old friends and chatting to new and repeat readers of our books. 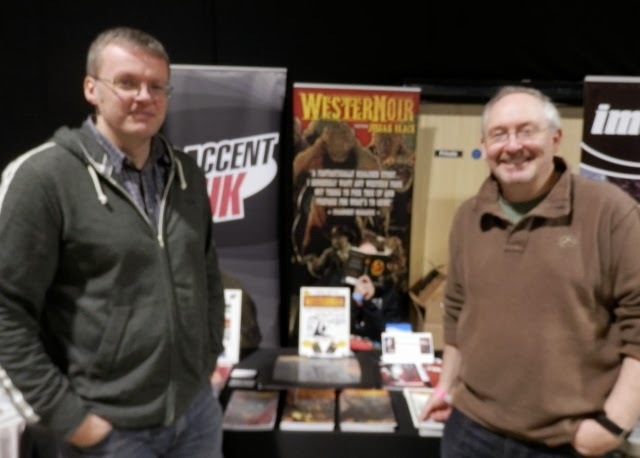 Once again Gary Crutchley was able to join us and work his sales patter to ensure that his and Dave's Westernoir series be the top seller with the latest book 3 outselling everything else by a good margin! Sadly Dave and I again failed to see any of the programmed talks and events - thats' none in the 7 years we've attended which is a shame especially as we'd greatly enjoyed the talks we caught at The Lakes recently. 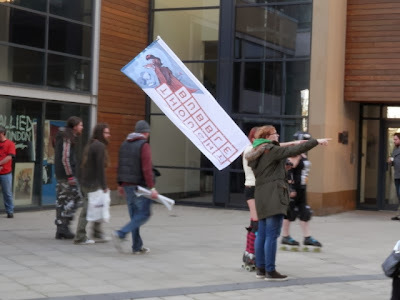 Mind you with a show the size as this you can't hope to see everything and certainly that was something I heard people repeat time and time again that it was 'too big' and they couldn't absorb it let alone buy everything they liked as there was just 'too much'! During my little escapes from the table I did manage to track down a few of the books I was looking for and a few that I'd not heard of before - see my 'haul' pic below - including an enjoyable book previously unknown to me, 'The IT Girl' by Jessica Martin based on the silent movie actress, Clara Bow. Its well executed and despite being a little short is a promising debut from the impressively enthusiastic Jessica, who has only recently entered the comics field after a varied and interesting show biz career! 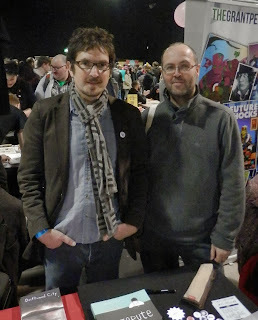 Other highlights was again meeting Frederik Peeters this time for his new sci-fi series Aama from Self Made Hero which I am looking forward to reading especially after his previous excellent Pachyderme book which I had a lively discussion with Gary Spencer Millidge about as we tried to second guess its meanings and imagery - great fun! Gary Spencer Millidge & GM Jordan strike a Thoughtful pose! 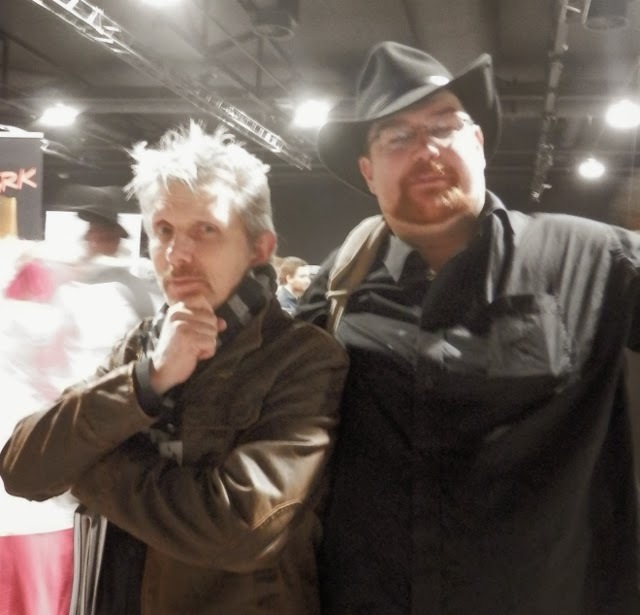 It was discussions like that throughout the show with numerous people - too many to list - that makes Thought Bubble special as most comics people will be there and its a great chance to catch up and chew the fat and with the show being so late in the calendar there's very much an end of term feel to it as you say your goodbyes and reflect on the close of another convention season. One final bit of very welcome news was when old comics pal, Neil Cameron told me that our very good friend and very deserving talent, Garen Ewing had won the British Comic Award for Best Young People's Comic for his Complete Rainbow Orchid book! Great stuff, we're all delighted for you Garen and will enjoy seeing you squirm with embarrassment with all the plaudits coming your way! You can read Garen's own report here and here's the full list of the 2013 award winners. I'll let Dave say more about Thought Bubble at the main Accent UK blog but for me, after a fairly indifferent expectation about the show, I was pleasantly surprised and reminded how special Thought Bubble really is and I sincerely hope they can come up with a workable solution to its exhibitor popularity so no-one who wants to be there misses out, lets see what they come up with? 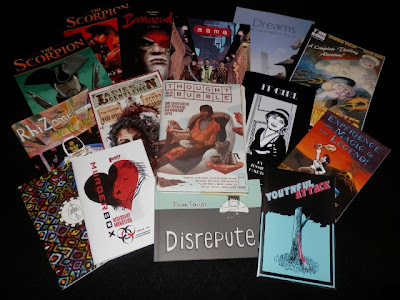 The 2013 TB haul and I still missed out on a couple of books!